A lot of people run DBA brakes for street use on many Renault models as an alternative to genuine Renault/Brembo rotors. 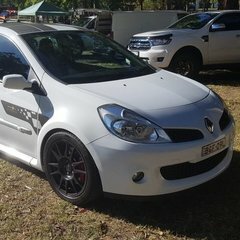 Find here: https://dba.com.au/products/catalogue/online-catalogue/ RDA brakes may make rotors for the Megane as they do for the Clio. They don't have a catalogue that I can find. Website: http://www.rdabrakes.com.au/ Both are Australian brands so in most cases shipping is not required depending on where you buy it from.